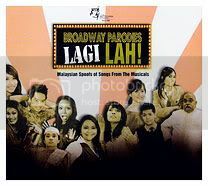 I was blessed enough to catch the first Broadway Parodies lah back in May 2007 when I was still in KL. I thought it was fantastic! So when word got out that they were doing it again, I was delighted but at the same time I wondered if I’d really bother to go all the way down to KL just for that (then again, I did it for Beauty & the Beast). Next thing I know, they say that they’re going to do a nationwide tour – and Penang was one of the stops! YAY! Thus I happily went to see the show on Friday night with Anna, Joyce and my sisters. It was SO fun! Most of the songs were the ones they’d done last year, but there were several new ones (like Under the Tree, Diamonds in Your Ears My Friend and Tomorrow) and most of the cast was new too. Anyway I didn’t mind at all. I like those songs. The jokes were hilarious and evidently updated to suit this year’s news. For example, leading up to the I Just Want to be a Dame song, the lawyer character was talking on the phone to his friend/client about taking a holiday to Christchurch and then later told said friend that “I’ve got the perfect defense for you! It looks like you, it sounds like you, but it’s NOT YOU!” Everyone just about exploded at that. Some brilliant person got some of the songs from one of the KLPAC shows and put them up on Youtube, so you can have a look at them.